Yes, smooth and velvety chocolate with cream is simple to make. But it does require a few techniques and tips to make right. Once you know the secrets, then it’s time for the best part: use it to make all sorts of delectable desserts imaginable! So read on, get your best chocolate bar ready, and have fun whipping up your own treats using a perfectly smooth ganache. Chop, pour, wait, and whisk to make a smooth and shiny ganache. A simple ganache recipe needs two ingredients: chocolate and cream. I like using dark chocolate but you can also use a combination of milk and dark chocolates to adjust the sweetness. Making your ganache smooth and glossy is important as it affects not only its appearance but also its mouthfeel or texture. To achieve this, you need to follow four easy steps. With a chopping board and a knife, chop your chocolate into small pieces. This will make it easier to melt in the hot cream and help avoid a gritty appearance when you combine the two together later. Place your chopped chocolate in a mixing bowl and set aside. Pour your whipping or heavy cream in a small saucepan and bring it to a simmer over medium heat. Swirl your pot from time to time and keep an eye on it to keep it from burning or boiling over. Turn off the heat as soon as you see small bubbles on the surface around the edge of the pot. Pour your hot cream into your chopped chocolate and give it some time to melt, about 3 minutes (wait up to 5 minutes if your are making a bigger batch). This waiting period brings down the temperature of your hot cream, which is key to prevent your ganache from splitting. Stirring it too soon will result in a rough texture. Once the wait is over, use a whisk to combine your chocolate and cream together. Put your whisk in the centre of your bowl then whisk in a small circle moving outwards. Keep whisking in a single direction, stirring in bigger circles. This technique ensures that the fat and liquid in the chocolate and cream are fully combined, forming a properly emulsified ganache. With this geeky part done, you can now use your ganache as a glaze, frosting, dipping sauce, filling, and more! Before you start getting creative with your chocolate ganache, you need to decide what you are using it for. Its texture and consistency should match your dessert in mind. A thick and spreadable ganache is perfect for filling or frosting your cake, while a thin and pourable one is great for dipping. Here’s a simple guide you can follow to know the right amount of dark or milk chocolate and cream for your ganache. 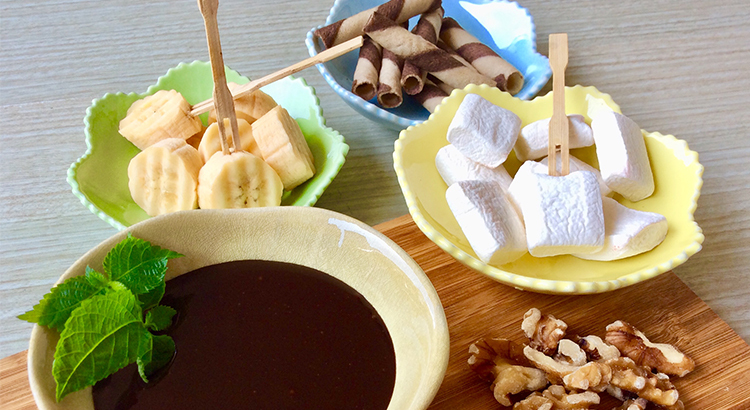 Fruits, cookies, and nuts definitely taste better when dipped in glaze-like ganache. Adding more cream into your chocolate gives you a thin mixture that you can enjoy sipping as a warm drink with floating marshmallows on top. This ganache will not set but it will become slightly thick as it cools, making it a delicious sauce for your fondue, cheesecakes, and frozen treats. Use this ratio when you want bittersweet ganache to go with your churros or on top of your donuts. Plain cupcakes look and taste more delectable with a glossy swirl of ganache on top. Cakes and ganache work hand in hand. Equal ratios of chocolate and cream make your ganache a lovely filling or frosting and should spread easily using an offset spatula. It’s great for filling tarts and macarons, too. When slightly warm and fluid, you can use this type of ganache to glaze your mousse or truffle cakes. Chill it a bit in the fridge to make it easier to pipe. Make sure you have melted your chocolate well or bits of chocolate may clog your piping tip. If you are working with fondant, this type of ganache makes a delicious first layer before covering your cake entirely with rolled-out fondant. A box of homemade truffles makes a great, not to mention yummy, personalised gift. Chilled ganache with a 2:1 ratio results in a thick and firm mixture that can be scooped or moulded with your hands. Use this combination to cover your cake with a beautifully piped ganache border or use a melon baller to make decadent truffles. Coat your truffles with nuts, cocoa powder, or coconut flakes and flavour them with liquor to make every bite special. Note: If you love the taste of white chocolate better, increase your chocolate ratio to make it set. Try using a 3:1 ratio, chill it overnight, then whip it to turn it into a spreadable frosting or scoop it out into balls to make truffles. Adjust the weight of your chocolate as necessary if live in a humid climate. Ganache tastes wonderful as it is but you can always make it your own by adding various flavours. Here are some suggestions and tips on how to properly flavour your ganache. Ganache can be flavoured in many ways. Choose, experiment, and be creative! Flavours of fresh ingredients like mint and orange zest are best infused into the cream during simmering. Use a strainer to strain your hot cream if you are using whole spices or leaves before adding it to your chopped chocolate. Coffee enhances the chocolate flavour, making it a great add-on for ganache. Do this by stirring in some espresso or instant coffee powder into your simmering cream. Try flavouring your cream with matcha powder to add delicious bitter notes to your white chocolate ganache. Flavours of extracts and alcohol are volatile and tend to lessen when added to a hot mixture. To make the most of their great flavours, add them to your ganache after you have combined your chocolate and cream together. Also, you may need to adjust the amount of your cream if you are flavouring it with extracts or alcohol. For instance, if you are adding 10g of Malibu (coconut-flavoured liqueur), reduce your cream by 10g as well. There are so many things to love about ganache. Other than its smooth texture, gloss, and flavour, ganache is a household favourite because of its simplicity. Despite its fancy French name, its ingredients are easy to find and you do not need to be a pastry chef to make it smooth and shiny. Still, things could go awry and suddenly you end up with a bowl of gritty mess. Nevertheless, there are ways to make it right or avoid the common errors in making ganache. There are many reasons why the fats and liquids in your ganache would separate. To avoid this, use good quality chocolate bars. If possible, do not use chocolate chips as these have been made to have a higher melting point, which is perfect for baked cookies but not for ganache. Make sure your cream is not boiling hot when added to your chocolate and do not put in too much liquid flavouring. Some chocolate varieties may not have the same glossy finish as others. Remedy this by adding in a small amount of soft butter or corn syrup to your recipe. After adding the warm cream to your chocolate, make sure to give it time to melt before stirring. Whisking it too soon can cool down the cream and may not melt the chocolate fully, leading to a grainy appearance. Also, make sure you whisk your ganache gently as overworking it may also lead to a rough texture. The temperature in your kitchen and the ingredient ratio may have something to do with this problem. To keep your ganache pliable while working in a cold room, place your bowl on a double boiler set on low heat or let it sit on top of a bowl with hot water. Adjust the amount of chocolate or cream in your recipe to achieve the texture you want. Give your runny ganache some time to cool down at room temperature or in the chiller to thicken up and become spreadable. If it gets too hard to spread or pipe, whip it using a hand or stand mixer to soften. Ganache is at its best when fresh but if you need to save time and prepare it in advance, transfer your cooled ganache in a resealable container and keep it in the chiller for a week. You can also store leftover ganache in the freezer for up to 3 months. Thaw it overnight in the chiller then whip it using a hand mixer to soften. Make sure not to refreeze ganache that has already been frozen and consume it within the week once thawed.